Do you remember a cookie from the 70’s with Rice Krispies cereal in them? I recall liking the crispy little bits in them as I never liked nuts in my chocolate chip or oatmeal cookies. The Rice cereal added a delicious layer of crispiness! Those cookies have been on my mind for some reason and I knew I had to recreate them! I looked around online to see if there is a specific name for cookies with Rice Krispies in them…I found Ranger cookies and Cowboy cookies out there, but most recipes for both of them also contained oats, nuts and coconut. I wanted to include pastel M and M’s candies as I have spring on my mind! 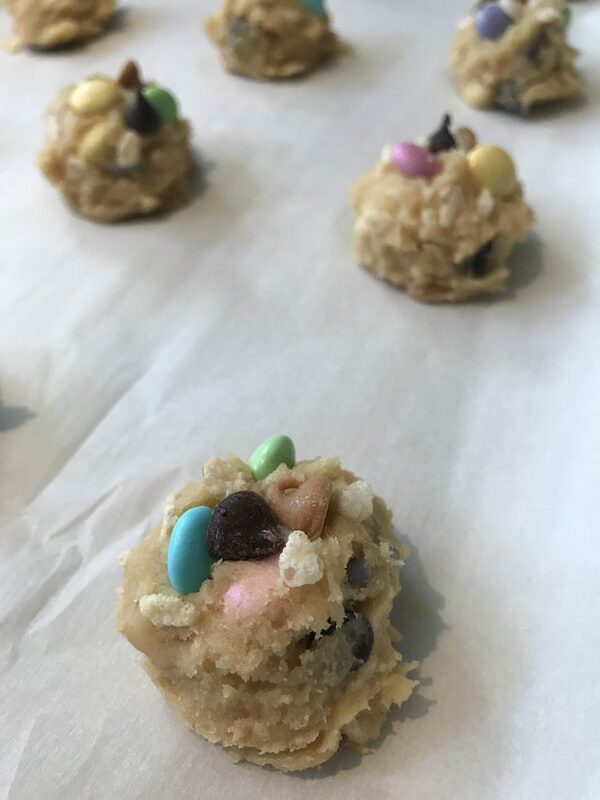 I decided to add some regular semi-sweet chocolate chips to go with the milk chocolate M&M’s – and some peanut butter chips too! I use a much smaller amount of peanut butter chips as I find they can be overpowering. When you add ingredients to a drop cookie they tend to stay hidden in the cookie dough… When food stylists are making cookies for photography or TV, they’ll hand place additional chocolate chips and such on the cookie dough balls before baking and even fill in the blanks with more chips and such after baking. Here I’m dipping my Rice Crispy cookie dough balls in additional Rice Krispie cereal. Hand placing M&Ms and chocolate and peanut butter chips before baking. You can place them close together as the cookie will spread as it bakes. 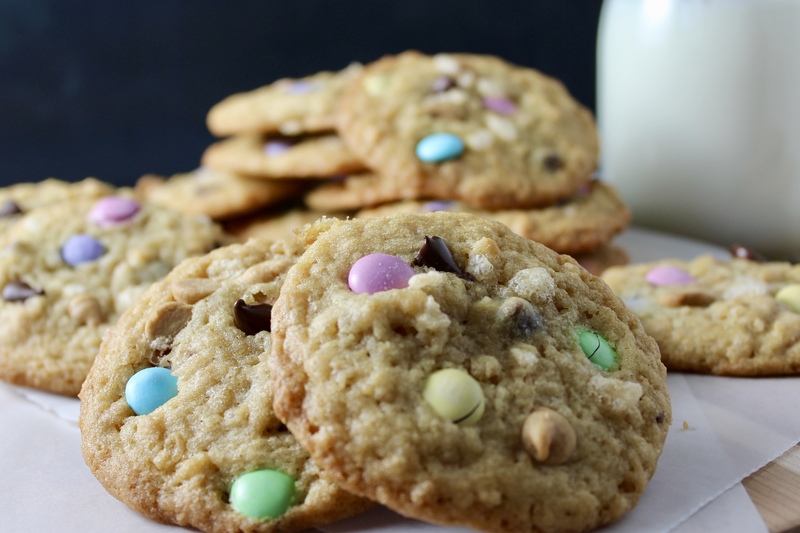 After baking, you can even wedge in a few more chips or m and m’s while the cookie is still warm and soft. The cookies will taste the same either way, but sometimes it’s fun to play food stylist! Recipe also added to Weekend Potluck hosted by The Country Cook, Served Up with Love, and South Your Mouth. Do you remember cookies from the 70's with Rice Krispie cereal in them? I recall liking the crispy little bits in them as I never liked nuts in my chocolate chip or oatmeal cookies. 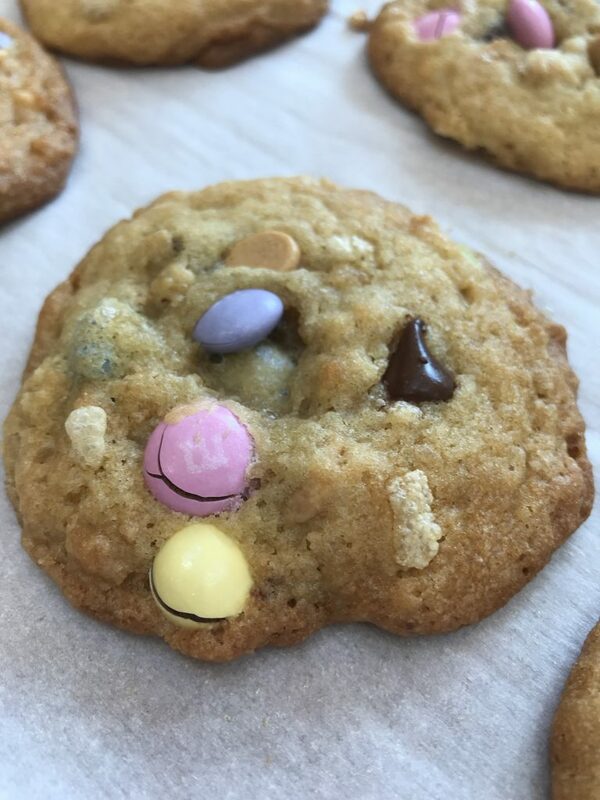 I created my own version with M&Ms, chocolate and peanut butter chips! The rice cereal adds a delicious crispy texture! 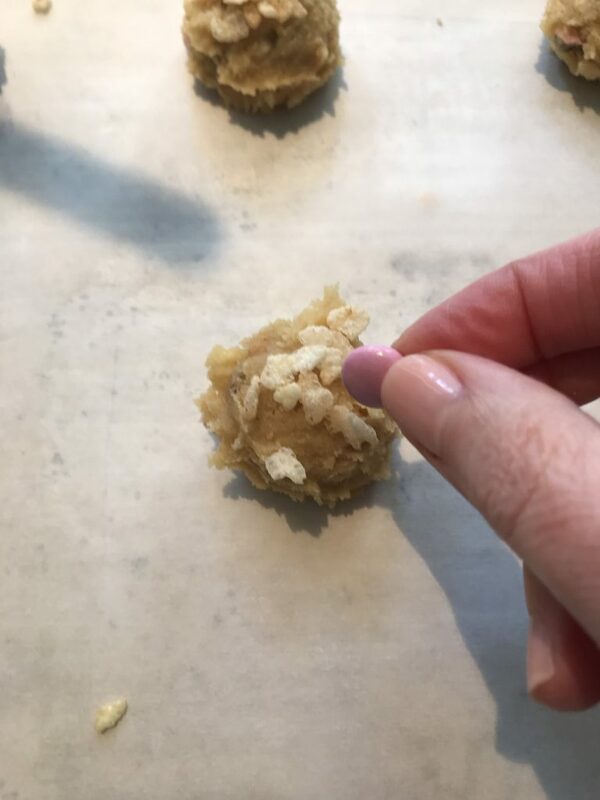 See the blog post for food stylist cookie tips! Preheat oven to 375 degrees. Line baking sheets with parchment, silicone mats or grease them. If using dark non-stick baking sheets, you may want to reduce the oven temperature by 25 degrees. Whisk together dry ingredients in separate bowl. Cream together butter and sugars. 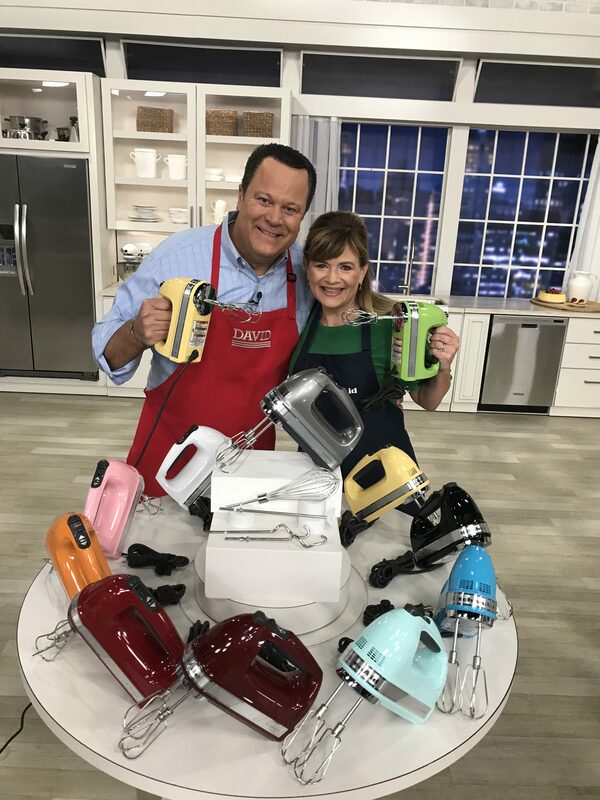 I use a hand or stand mixer. Cream until the mixture is lightened in color and fluffy. 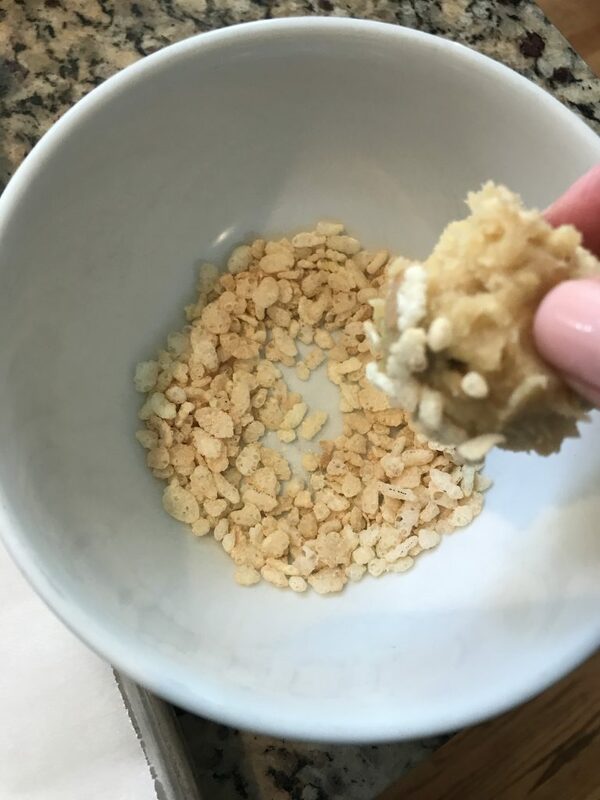 Add rice crispy cereal and mix on lowest speed for just a few turns, finish mixing by hand - to not crush all the cereal. Scoop by 2-tablespoon portions onto prepared baking sheet. Add extra chips, candies and cereal to tops of dough portions if desired. Chill for about 30 minutes in the refrigerator (can chill overnight). I usually chill them all on 1 baking sheet and then spread them out onto more baking sheets before baking. Bake for 10-12 minutes or until golden and set on the edges and not quite set in the center. Cool on pan for 1-2 minutes, then transfer to cooling rack. 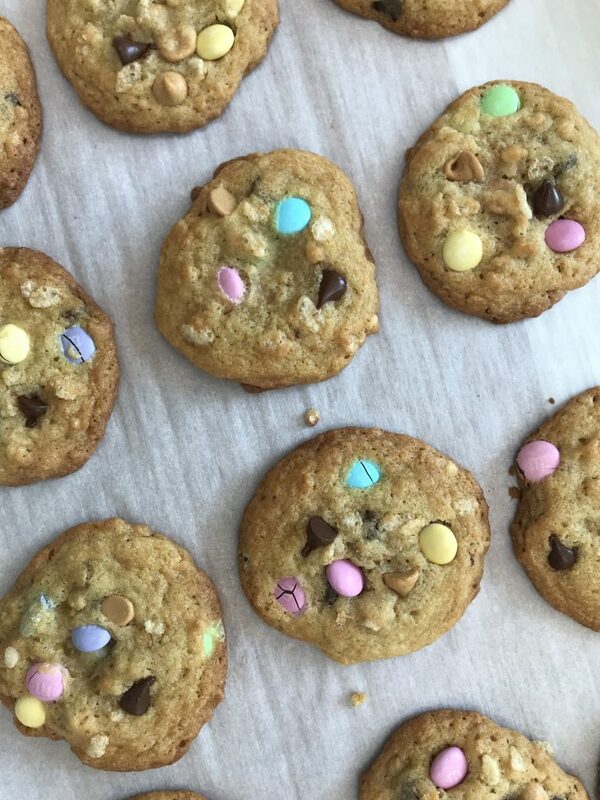 Tina, I made these cookies this afternoon and they are yummy! Thank you for the recipe.